THE END is an opera birthed out of the collaboration between trend setting spirited young individuals including musician and artist Keiichiro Shibuya, director and script writer Toshiki Okada, and illustrator YKBX. We’ve got some big Vocaloid fans here in Alpha Entertainment, and so we’re holding not one, but two contests and a bonus one, to bring more of Miku and friends to Scandinavia! Alpha Entertainment might be a Danish publisher, but we’re opening up these contests for all of Scandinavia, which means that fans from all these countries can join our contest: Denmark, Finland, Iceland, Sweden, and Norway! 「Idolm@ster 2」 DLC catalog vol.4 features the second TV anime change opening theme, as well as new downloadable costumes and accessories. But that’s not all. 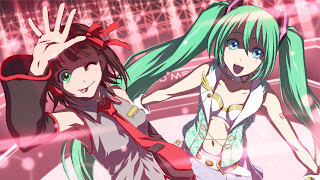 Also included in the pack is Miku’s Append costume. All this will be available at the Japanese PSN store come February 1st.